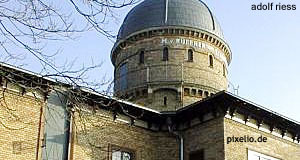 The Kuffner Sternwarte is a primarily historic star observatory that was built between 1884 and 1886 with private funding. It is situated in the 16th district of Vienna, Ottakring, and was the toy of a wealthy entrepreneur and nobleman, Moriz von Kuffner. Despite of the star observatory being a purely private enterprise, it was from the beginning aimed to be run as a proper scientific institution. The first scientific chair of the Kuffner Sternwarte was Norbert Herz, who also initiated the project with Moriz von Kuffner. The architect was Franz Ritter von Neumann the younger. In 1889 and 1890, the Kuffner Sternwarte was extended significantly and got four astronomical instruments at a rather astronomical cost - once again, Moriz von Kuffner helped out financially. After this modernisation, the Kuffner Sternwarte became an internationally highly regarded observatory and ranked among the biggest in the Austrian-Hungarian Empire. These four instruments, a refractor, a meridian circle, a vertical circle and a heliometer were built in Hamburg and Munich and are still in place in the Kuffner Sternwarte. The producing companies "Repsold & Söhne" and "Steinheil" were among the best in the production of scientific instruments. The four Kuffner instruments were recently renovated and can be seen with special guided tours. From around 1880, several significant Austrian astronomers worked at the Kuffner Sternwarte, most importantly Karl Schwarzschild. He was a leading figure in developing techniques to take photographs of stars, planets and other astronomical objects. With WWI, the Kuffner family - a dynasty of beer brewers - got into financial difficulties and the Kuffner Sternwarte was closed in 1915. After the war, there were several attempts to re-open the star observatory, but political change and the World Economic Crisis repeatedly prevented this from happening. The outbreak of WWII finally destroyed all hopes for a re-opening. In 1947, the Kuffner Sternwarte was re-activated, but not as a star observatory - it became an educational institution. In 1977, it was listed and belonged to a real estate agency until 1987, when the city of Vienna bought it. This was concerned with the lobbying of a society of friends and supporters of the Kuffner Sternwarte, who spent a great deal of time and energy into saving the observatory from decay. Things turned for the good afterwards: The Kuffner Sternwarte was refurbished between 1989 and 1995 and implemented into the educational program of the Volkshochschule Ottakring, a sort of community college in the British sense. The events that take place in the historic star observatory fall into three categories: Museum-related ones, astronomy and education - especially for adults. The area where the Kuffner Sternwarte is located is completely inappropriate for serious star observation today - ways too much light from the city of Vienna. However, for educational purposes, a CCD sensor was recently mounted to the historic refractor. The society Kuffner Sternwarte is still active and involved with the organisation of many events and guided tours at the observatory. If you plan to attend a guided tour, I would recommend to wait for a clear night - when there are no clouds, visitors can observe stars and planets using the historic refractor. Attractions nearby are as good as non-existing. If you feel like a little walk, you can go to the Baumgartner Höhe, a psychiatric hospital, and see the quite remarkable Kirche am Steinhof Church. The Schloss Wilhelminenberg Palace is also a good starting point for excursions into the Vienna woods. A nice walk would lead to the Heurigen taverns of Neustift am Walde. The tourist information centre of Vienna published hiking maps that give you a nice outlay of attractive routes and places to go - including nice, traditional Heurige and inns on the way.